Clemson head coach Dabo Swinney said before last night’s Orange Bowl he hoped people would be talking about his team’s defense when the game was over. Well today we are talking about it. There’s lots of talk about how West Virginia quarterback Geno Smith skinned, gutted and tossed the entrails of the Tiger defense all over the field. It’s a good thing the Miami Dolphins don’t need to use Sun Life Stadium this Sunday, because the cleanup crew might still be working through the weekend. All week there was talk of Tajh Boyd’s solid play this year, how talented Sammy Watkins is and OMG IS DEANDRE HOPKINS GOING TO PLAY? Not a word about how the Mountaineers closed out the season with three gritty wins to clinch the Orange Bowl birth. Not a word on do-it-all returner/receiver Tavon Austin and how he’s probably better than Watkins. Not a word on how Clemson sputtered toward the end of the season and probably was really mediocre to begin with. 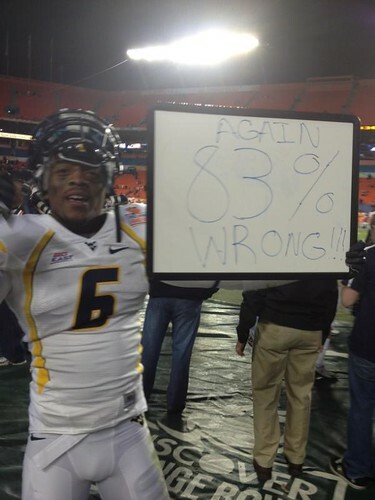 So West Virginia shows up on a chilly night in Miami and put the much-hyped Tigers through a meat grinder. For those of us that follow the Mountaineers, it was nothing we hadn’t seen before. In fact, because of the 2008 Fiesta Bowl a lot of fans felt confident. Being big underdogs to Oklahoma, hoping for the best and ending up with a first-class victory, many fans weren’t worried about Swinney and his Tigers. In retrospect, Swinney’s statement about his defense sounds stupid. Almost as dumb as the throngs of Clemson fans who must have stopped at the Gap before the game and coordinated their outfits. Was there a secret Facebook group that outlines what kinds of button downs and loafers you’re required to wear on gamedays? I’d really like to know. 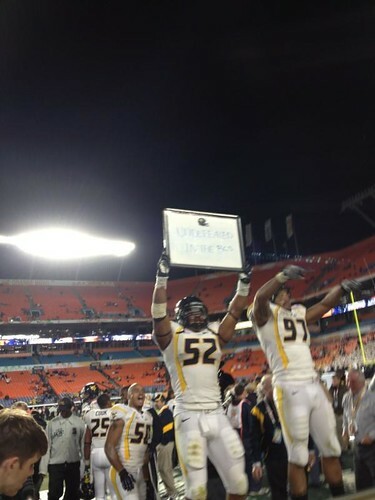 The Mountaineers felt disrespected, and rightfully so. As the romp continued, the beers flowed heavy for the Mountaineer faithful and Clemson fans loosened up their bow ties and sulked out of the stadium. Up 29 points at the half and then with two more scores right out of the gate in the third quarter, the feeling amongst West Virginia fans with almost 25 minutes left was, what now? The game was over and we celebrated the victory at halftime. It was an odd feeling being up so big, even if Clemson smelled like a bunch of frauds. But this fraudulent? I guess it shouldn’t have been too surprising. Clemson did was Clemson does. Beating their chests before the game like it was different this time. It wasn’t. They were the same old Clemson, blowing it when it looked like they wouldn’t. It’s the same thing we’ve seen for the last 10 years. We should’ve seen this coming. Conversely, West Virginia did what West Virginia does. Taking care of business in the Big East and now going undefeated in BCS games. Listening to praise being piled onto the opposing squad, only to show them up in demoralizing fashion. That’s what West Virginia does. So on that chilly night in Miami, the Mountaineers took their talents to South Beach and will now take them to the Big 12. They showed they can throw their weight around and with a 70 point outburst, Dana Holgorsen sent a memo to their future conference rivals: They’re not to be taken lightly.